I am a native of Alabama, and grew up vacationing on the sandy white beaches of the Gulf Coast. 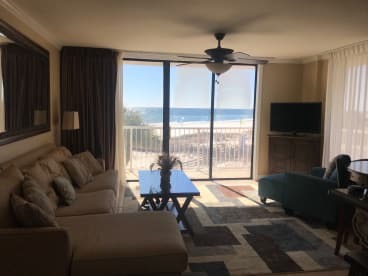 Our family loves to travel, but we spend most of our holidays at our second home in Orange Beach, AL. My husband and I have owned our condo for ten years and manage all bookings and rentals ourself. Our complex includes three swimming pools, tennis courts, and plenty of areas for the kids to run and keep busy while we relax and rejuvenate in the warm salty air. Our favorite restaurant in Orange Beach is Doc's Seafood, and we love to eat at The Original Oyster House in Gulf Shores. It's a family tradition to walk across the street to Adventure Island in the evening to race go-carts and see who gets the highest score on ski ball. We have watched dolphins playing, water spouts, and even a beached dolphin rescue from our balcony. And we've enjoyed many meals together as a family sitting outside watching the waves and tide come in. We sincerely hope you and your family will make many wonderful memories and enjoy your time at Seaside Beach & Racquet Club as much as we do!